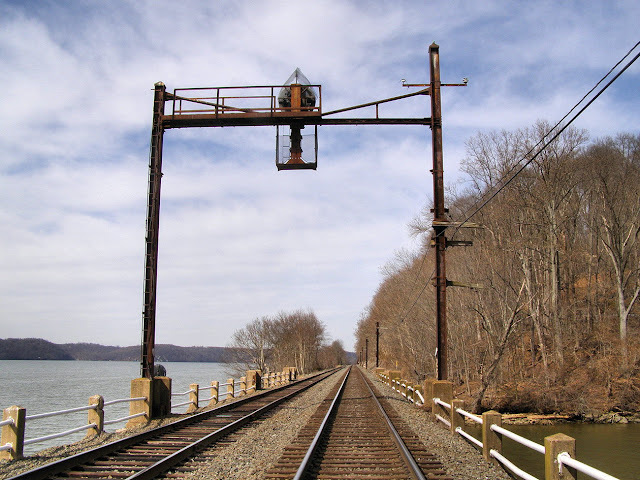 Well it's time for another installment of Port Road Trips and like many budget re-signaling projects I am making slow yet steady progress working down the line. 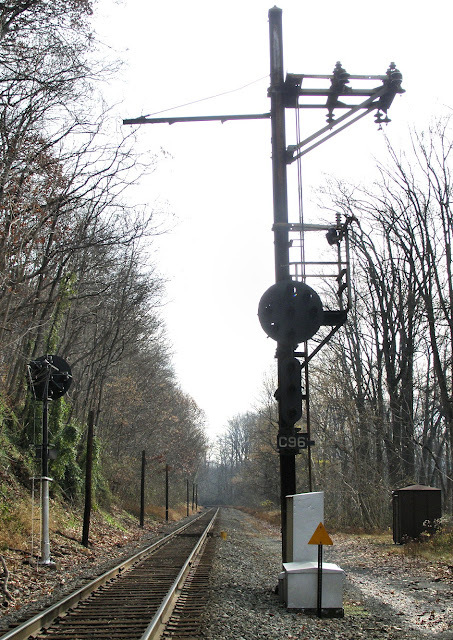 This week we will be looking at the Pilot siding between CP-PILOT and CP-WEST PILOT and the intermediate signal between Pilot and CP-WEST ROCK. For reference here is the relevant sheet from the 1997 Conrail interlocking chart book. 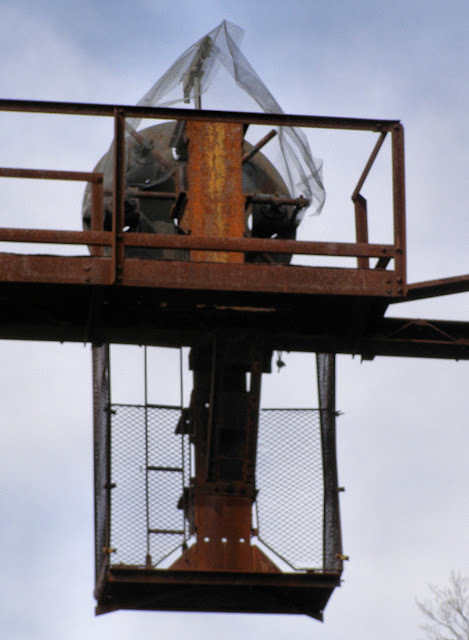 Since the southern end of the Port Road is still traditionally signaled I was able to conduct more recent surveys instead of having to rely on the 2004 photos. 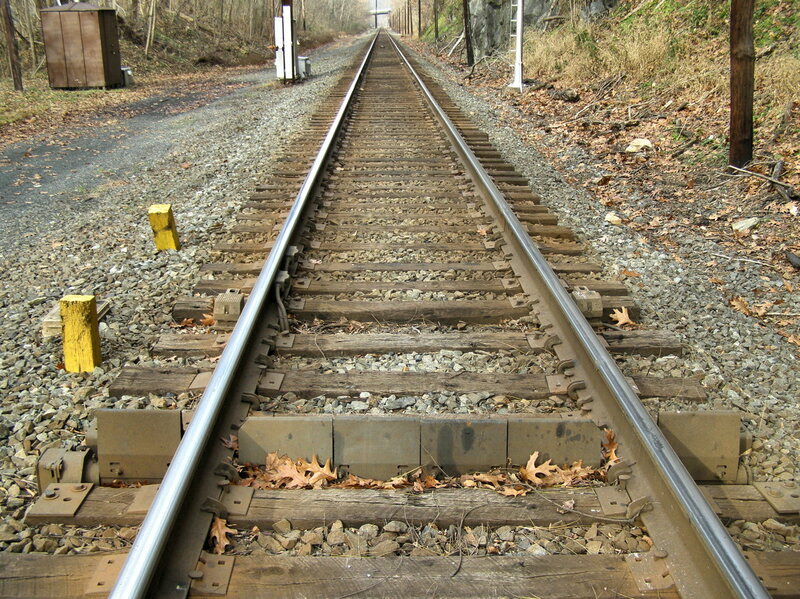 We will begin with CP-WEST PILOT at the upper end of the Restricted speed Pilot siding. 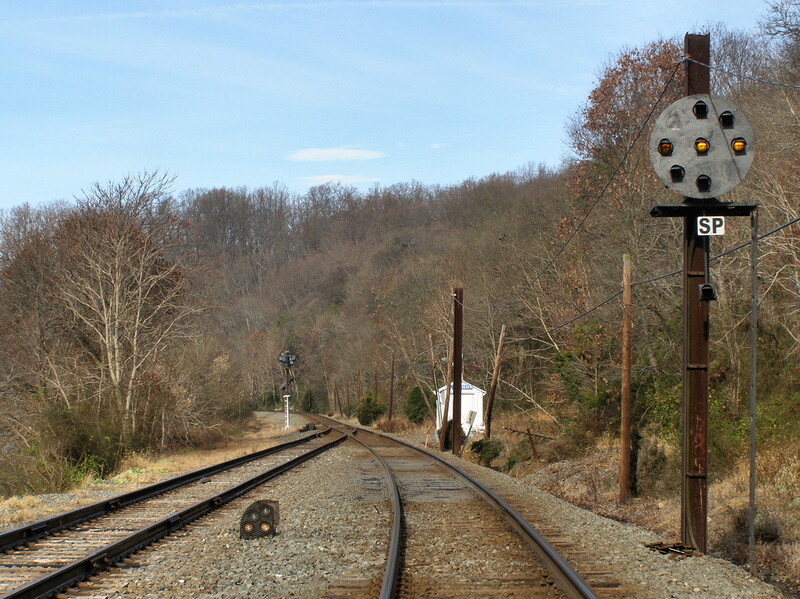 This siding was identical in function to the Harbor siding before it was upgraded to "signaled" with medium speed entrance and exit. 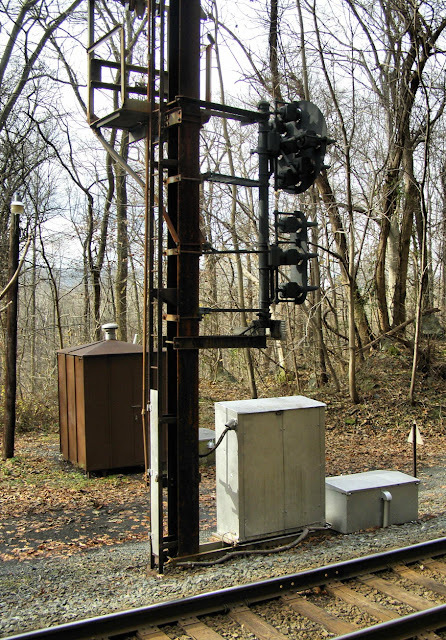 This means that the signaling was fairly simple with Restricting lower heads and dwarf signal siding exits. Looking towards CP-WEST PILOT from the west we find the 230L PRR PL mast signal guarding the single switch into the siding. 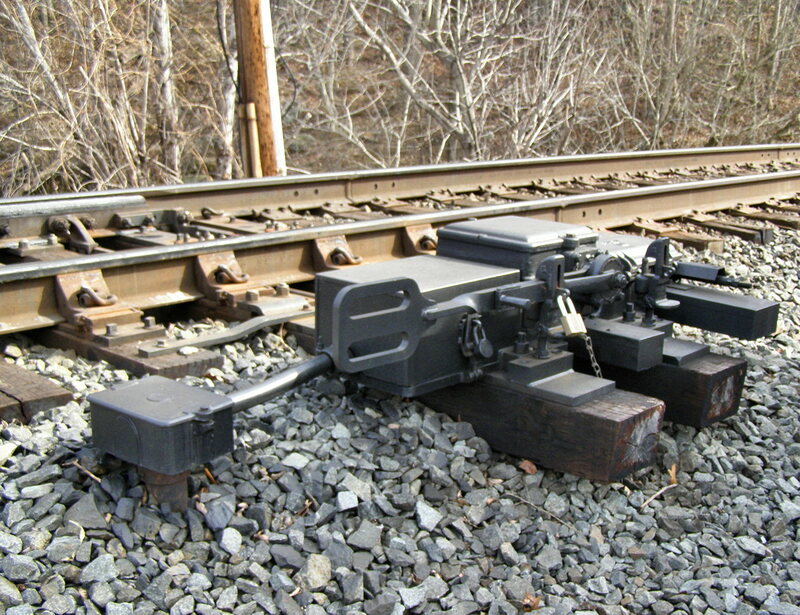 The 230L is a Conrail hybrid type with the full upper head replaced with a newer Safetran model while the lower head remains a US&S PL3. 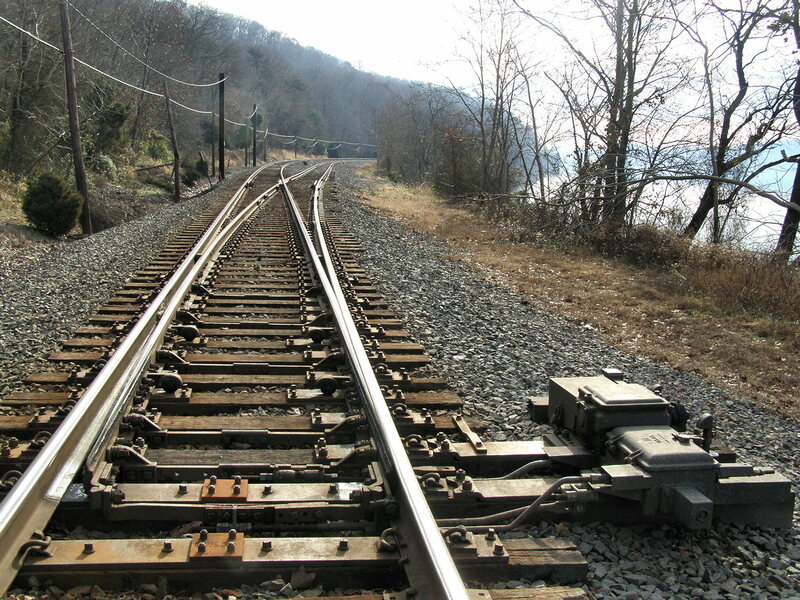 As I said before the \ lower head governs movements into the unbonded siding. 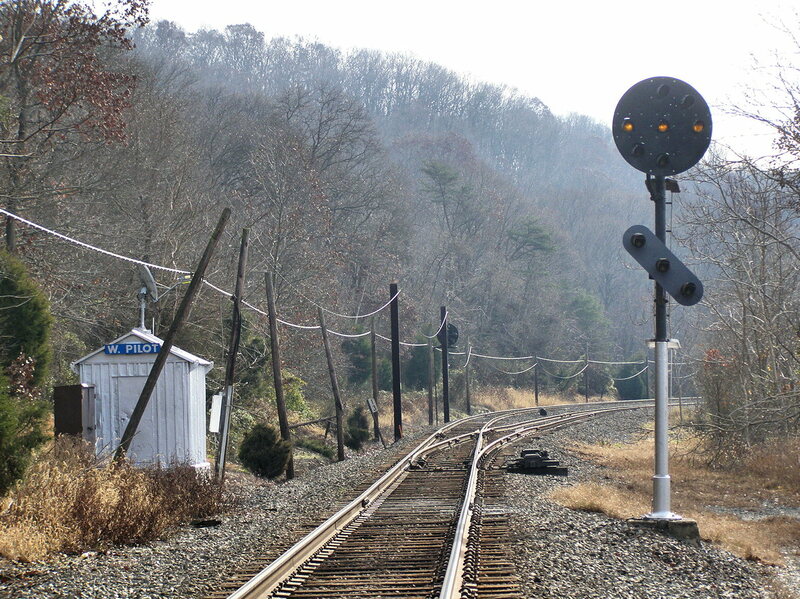 We can also see that this signal was not included in the NS refurbishment program. 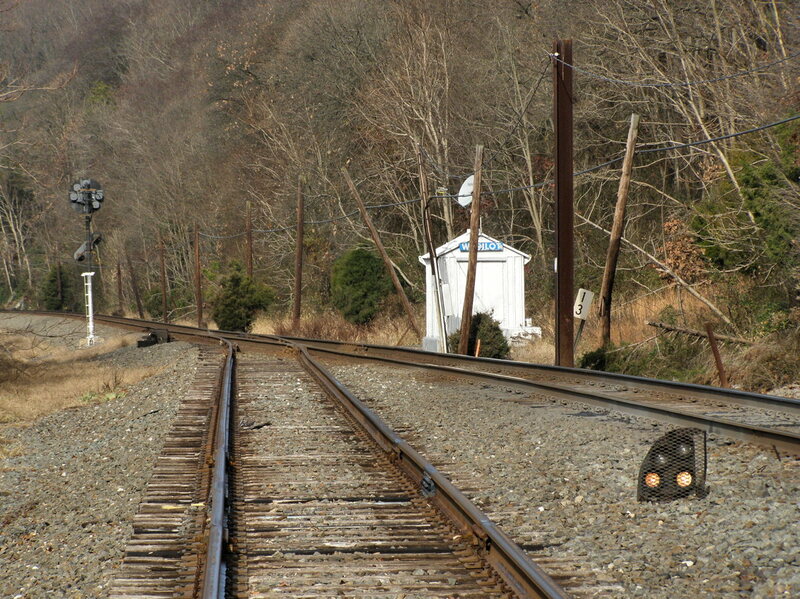 The paint dates from the Conrail era and the wiring is possibly original. 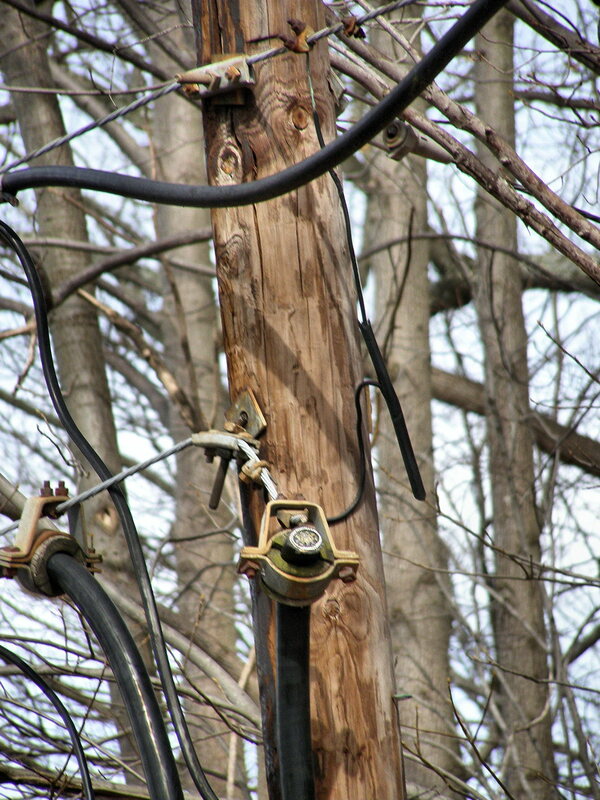 A new high voltage M23 replaced the non-dual powered M3 that was originally installed on the 229 switch. The switch looks like it would be good for higher speeds so when this is eventually re-signaled look for the siding to become signaled. 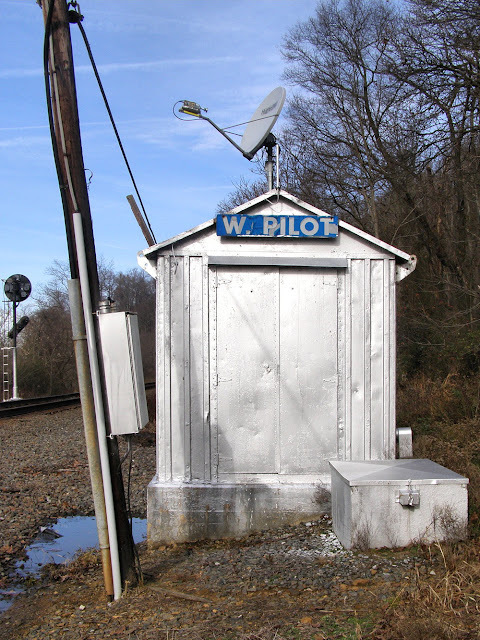 The WEST PILOT relay hut has gotten a nice fresh coat of silver paint along with a satellite dish fashion accessory. Also present is the battery well and a number of cable penetrations. As with the other locations in the south some elements of the code line appear to be in service while others appear to have been quite literally cut. 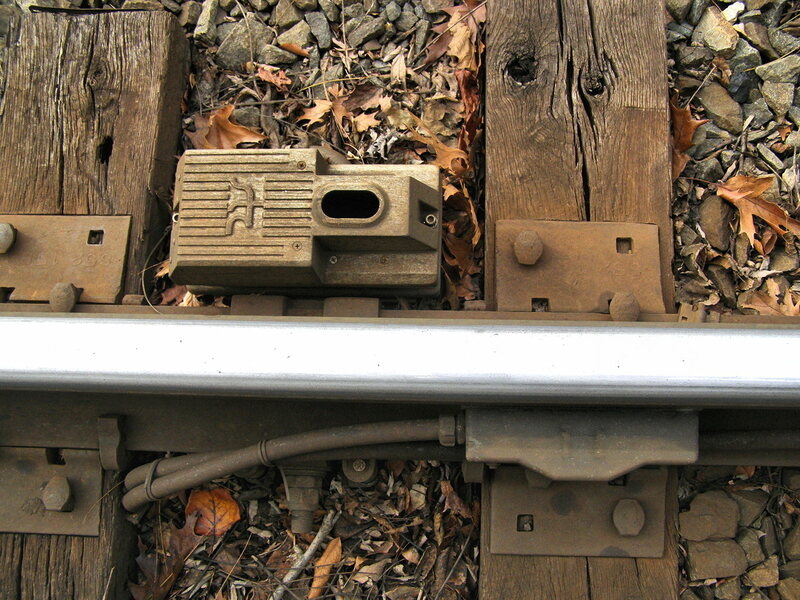 Here we see the two lever 230R signals. 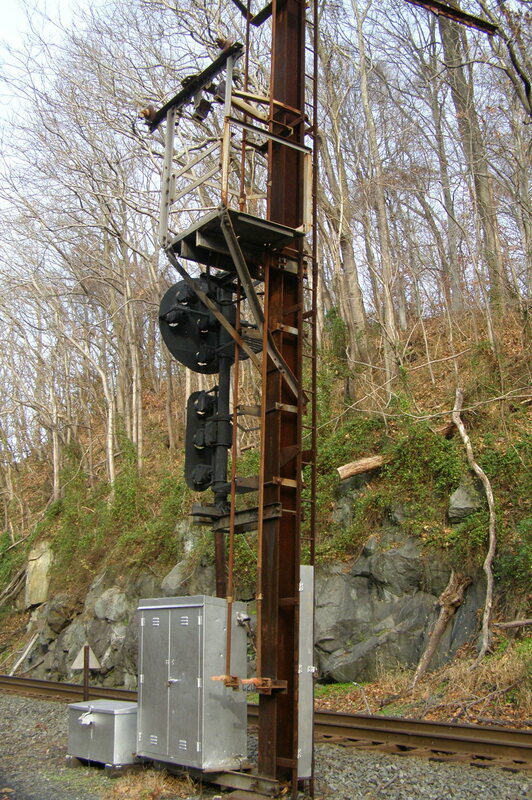 The main track high signal is mounted on an old catenary pole stub and the siding signal is a PRR PL dwarf. 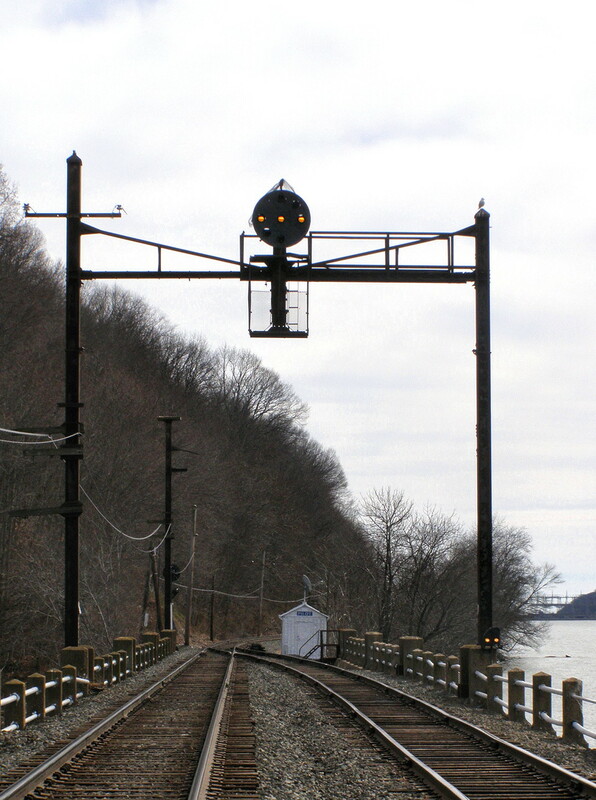 Here is a view of CP-WEST PILOT as it appeared in 2004. Aside from the whole catenary poles this interlocking has probably changed the least from the PRR days. Anyway, the westbound main signal was given a fresh coat of black paint, but that is not the most interesting detail. No, I'm not talking about the white "slide protection" placard either. 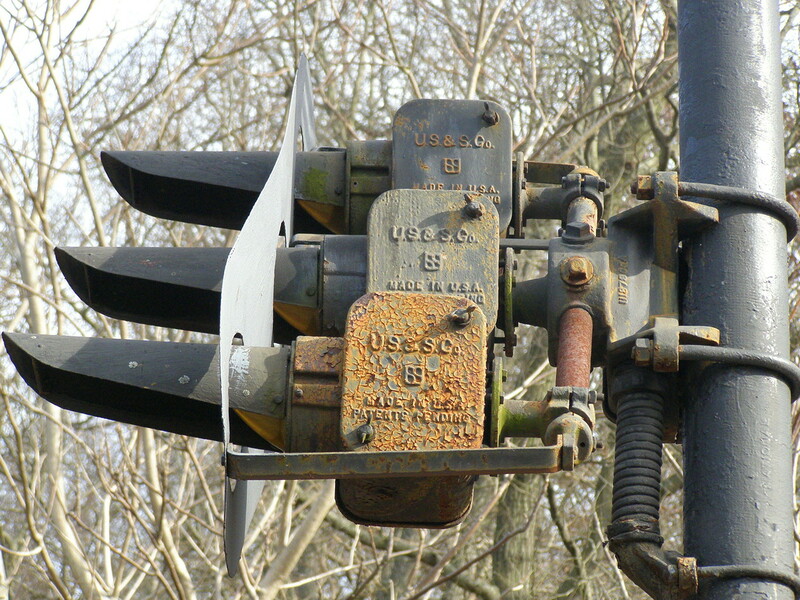 The 230R signal has not only retained a Stop and Proceed market light (something NS has removed at other interlockings), but it is a rare literal example of a "hanger" lamp. 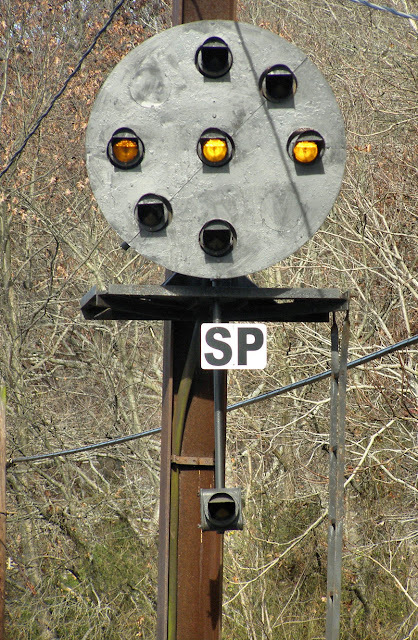 The colloquial term for the Stop and Proceed marker (and often the Restricting \ )on PRR PL signals is a "hanger". Well now you can see where the term came from. While there might be other examples, this is the only one I am specifically aware of. 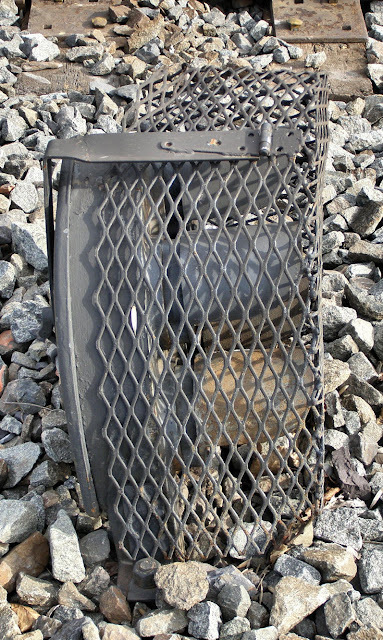 Also note the signal cable which may or may not have been refurbished. 230R looks even crazier from the side. 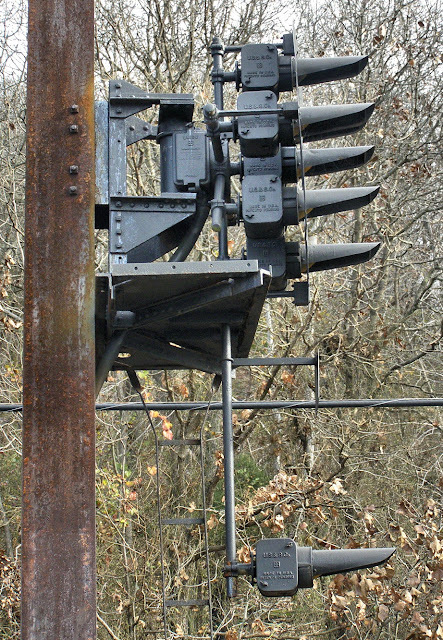 It's these types of unique signal mountings that one just doesn't see anymore under the current regime. Observing the interlocking from the point of view 230RA dwarf we can see from the shine on the rails that the ~5000 foot siding sees a fair amount of use. CP-WEST PILOT is located at exactly Milepost 13 (from Perryville). The 230RA dwarf is capable of Slow Clear and Slow Approach proceed indications, but also features a vandalism cage. 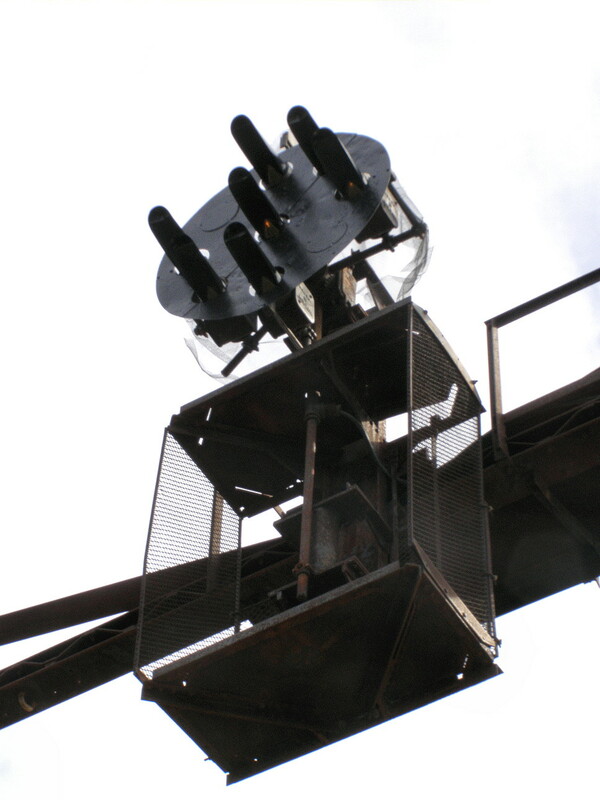 While it is unlikely that anyone hike out to CP-WEST PILOT just to shoot out some lenses, trains can kick up rocks or grab other debris that can damage such low mounted signals. 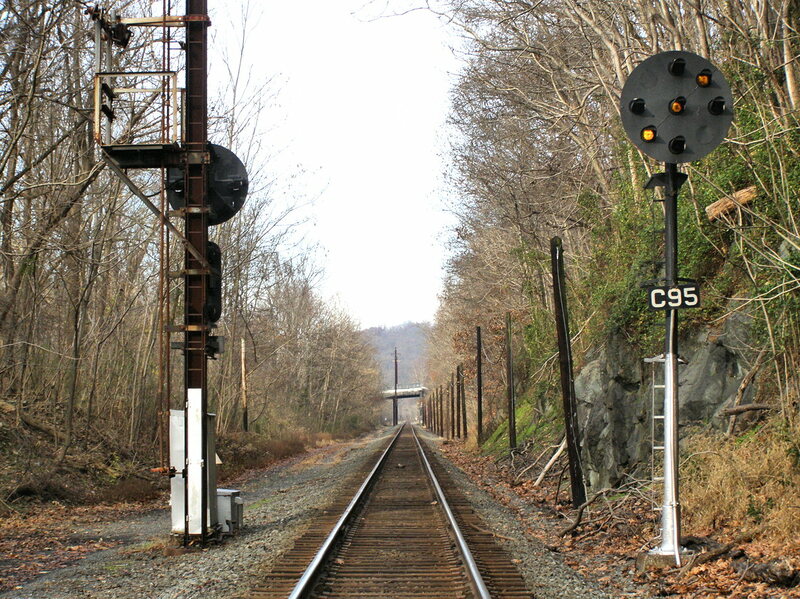 CP-PILOT is the mirror opposite of CP-WEST PILOT, but due to the right hand rule of signal placement the eastbound main signal must therefore be mounted on a catenary gantry with the dwarf along side in a similar fashion to CP-JEB. No, your eyes are not playing tricks on you. 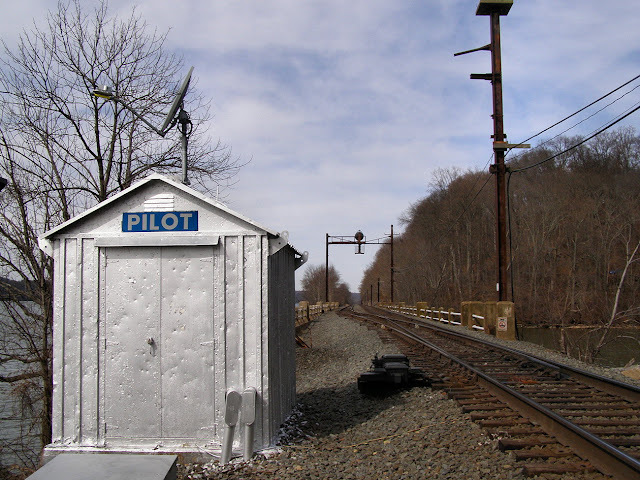 CP-PILOT is mostly located on a bridge spanning a tributary of the Susquehanna river just north of the Conowingo Dam. Since the general removal of the catenary supports the 226L signal gantry is one of the few that remain. 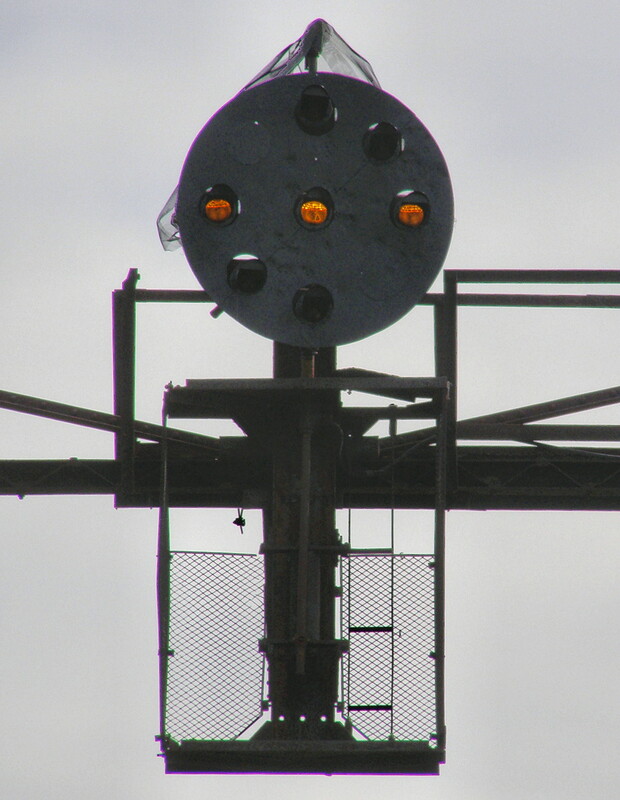 Today the 226L consists of a single full upper head, the lower Stop and Proceed marker light having been deleted. 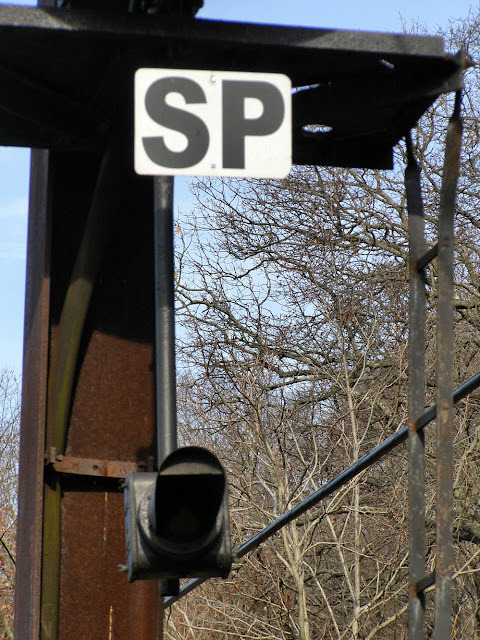 I suspect the presence of the Stop and Proceed marker on signals at CP-MIDWAY and CP-WEST PILOT is to allow the dispatcher to establish a route into the single track section if the slide fence has been activated. 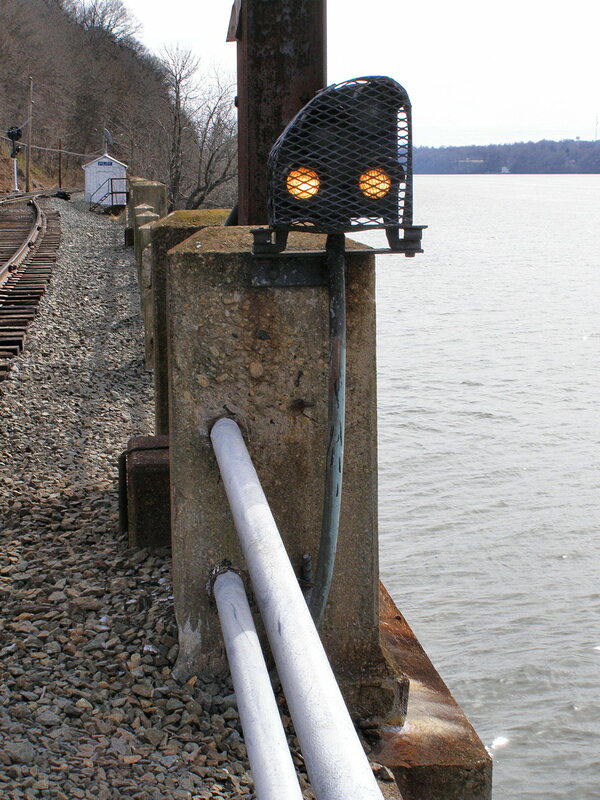 From this angle you can see where the marker lamp used to be mounted. 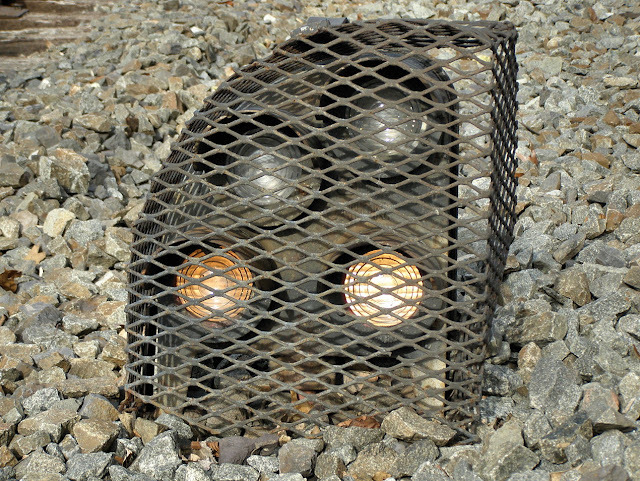 Due to the prevalence of large birds of prey in the area the head of the 226L signal has been covered by wire mesh. The 226LA dwarf is mounted on the same bridge alcove that holds the catenary support. As with CP-WEST PILOT it is a full feature dwarf and has been fitted with a rock guard. 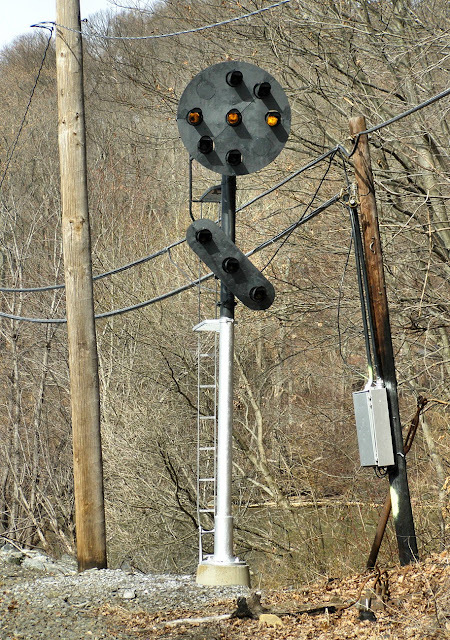 Looking from the rear we can see the fresh black paint and also the mechanism that locks the rock guard onto the signal. The CP-PILOT relay hut is located on the river side of the tracks making it slightly more vulnerable to flooding, although the nearby dam ostensibly sets a limit on how high the water can rise. 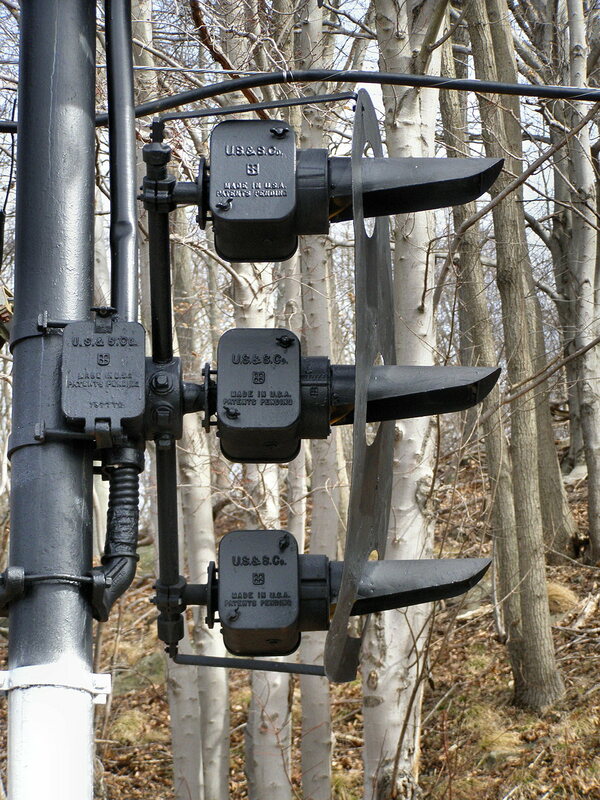 Again we find a brand new M23 point machine powering the 225 switch. These photos were from 2011 and the paint is still quite fresh. 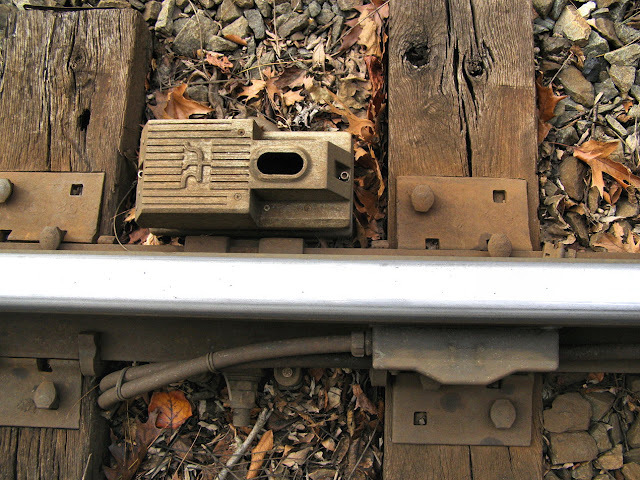 The original M3 machine had to be hand cranked if signal power was lost. 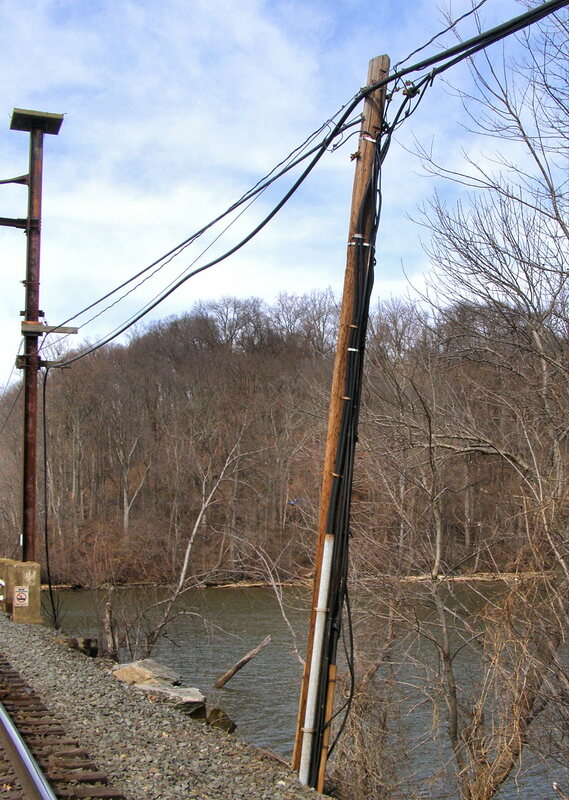 Something that could happen with great frequency with the 6.6kv signal power line running all the way from Perryville or Safe Harbor. This might be a record for shortest cable run from a CIL to a point machine. 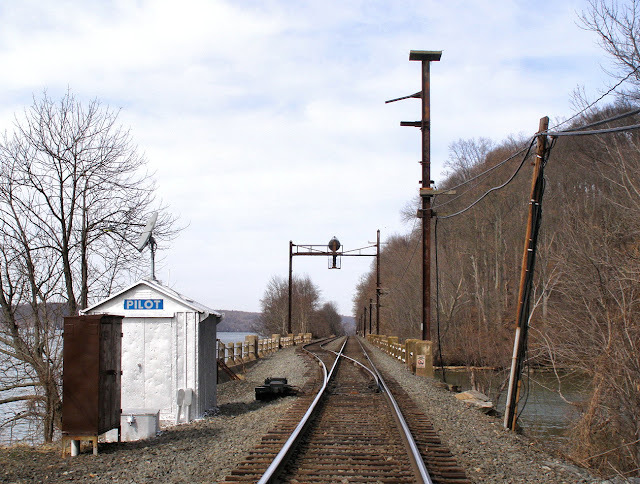 The relay hut is freshly painted with the original Conrail signs. 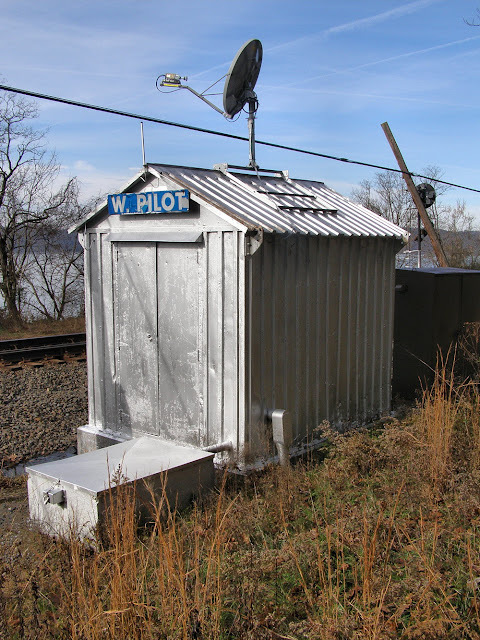 Because the CP-PILOT relay hut is located on the river side of the tracks the code line had to be gathered on the land side and then run under the trackbed. In 2011 the paint was almost wet on the 226R PRR PL mast signal. A mirror of he 230L, it had a full upper head and a lower Restricting \ for movements into the siding. 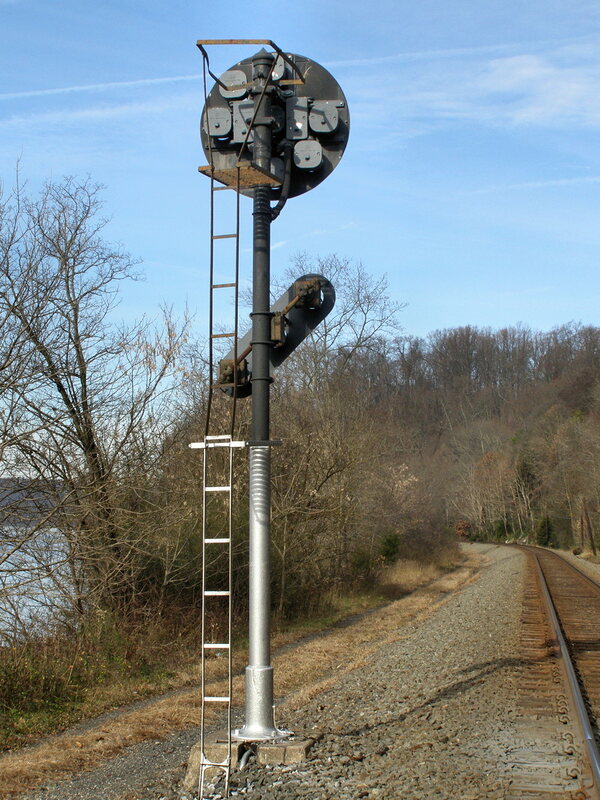 The NS C&S forces were also good at painting the lower half of the signal mast silver in the style of PC and Conrail. Not a single nook nor cranny was missed. It also looks like a new cable was run to the signal, but I didn't take enough photos at the time to see the extent of the re-wiring. Compared with 2004, the 226R has seen substantial upgrades with not only a fresh coat of paint, but also a backing plate applied to the lower \ head. 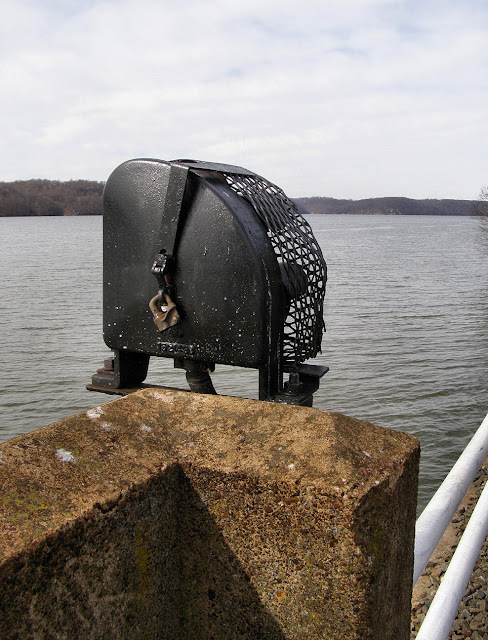 We now arrive at the last location in today's installment, the C96/C95 signal located a fraction of a mile south of the Conowingo Dam. 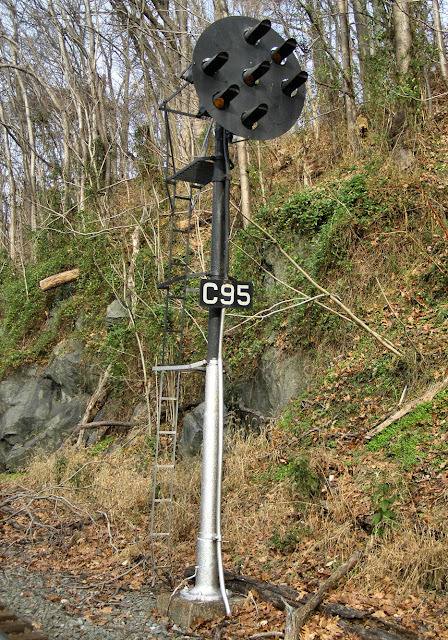 This intermediate signals is between CP-PILOT and CP-WEST ROCK, but due to the restricted speed of the Pilot siding, only the eastbound C96 signal is fitted with a lower | head for Approach Medium indications. The westbound C95 position light mast has both been painted and fitted with a new signal cable running back to the relay box. Because traffic is thrown westbound it is lit up and displaying Approach for the Stop at CP-PILOT. Opposing the set traffic direction, the C96 signal is dark and lifeless. The catenary pole it was attached to has been spared the scrapper's torch As the number plates suggest this signal is 9.6 miles from Perryville. The 4-mile long controlled siding between CP-WEST ROCK and CP-TOME has Medium or Limited speed turnouts at each end thus the need for the lower | head. C96 has been given a fresh coat of paint like its brother. The PCB laden transformer has actually been removed from the old power supply of this signaling location Both the relay cabinet and battery box have been given a nice coat of silver paint. A special bonus at the MP 9.6 signaling location is the Conowingo defect detector, detecting both dragging equipment and hot axle bearings. Well we're getting close to the end here. Next time we'll explore CP-WEST ROCK, the MP 6 intermediates and then CP-TOME.